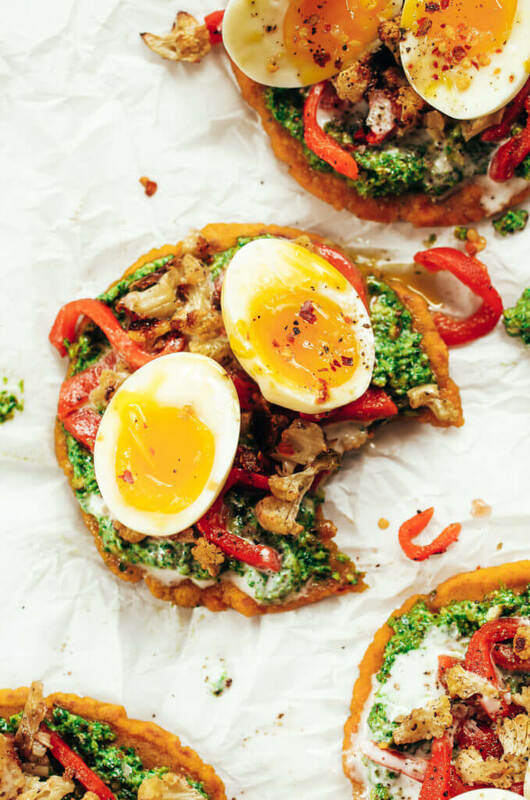 Fresh and flavorful sweet potato pitas with 5 minute kale avocado pesto! 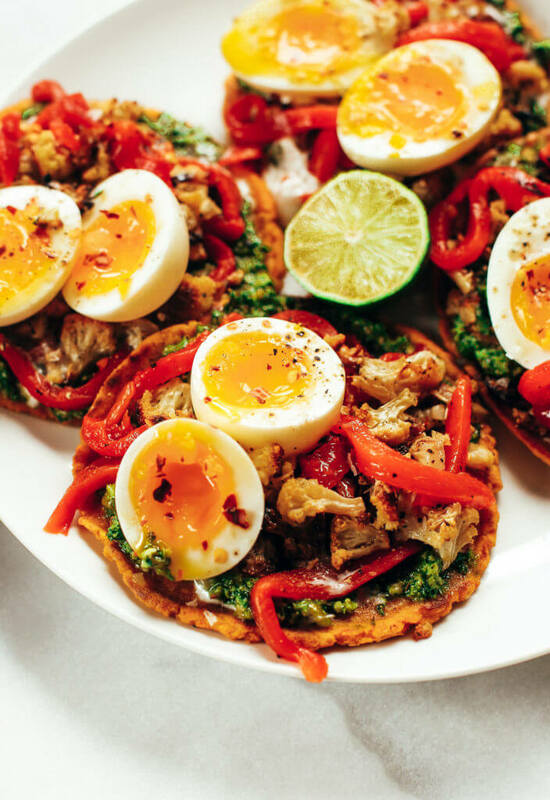 An easy whole30 and paleo meal prep idea for family dinners this summer. Are you sure you are ready for this? 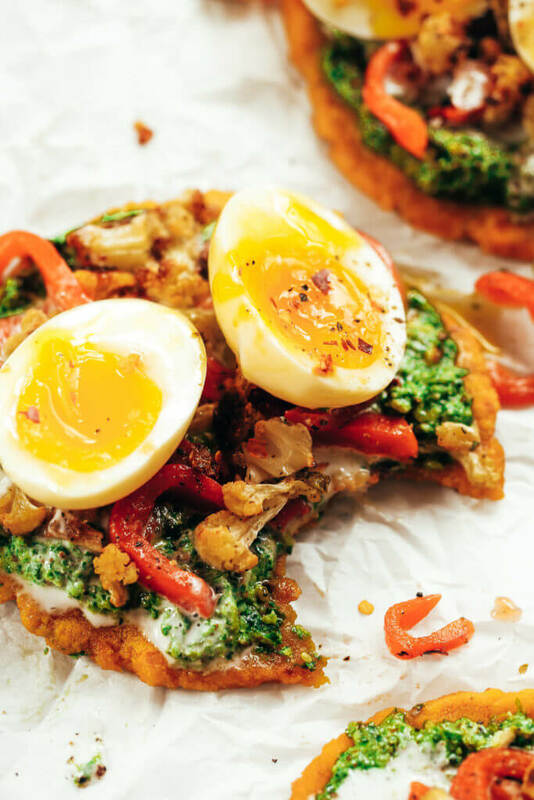 For the layers of kale pesto, golden roasted cauliflower florets, and jammy eggs. It’s the real deal peeps. 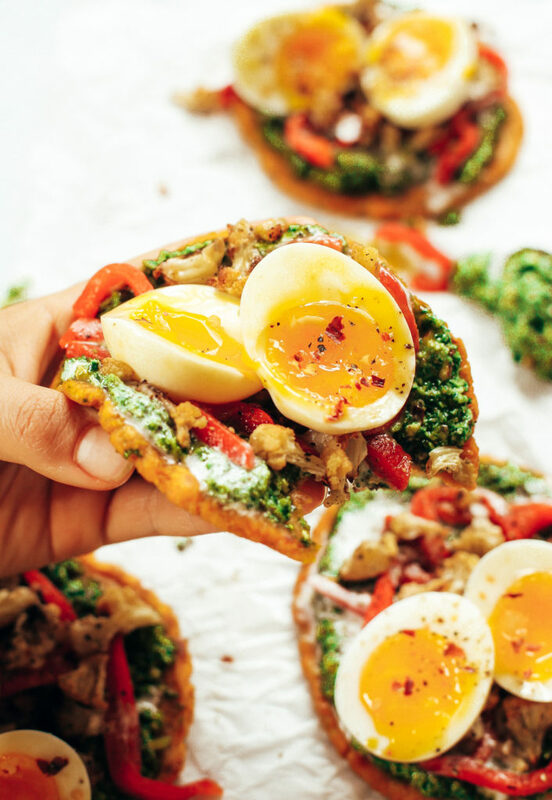 Think breakfast taco, meets pizza, meets best-flavors-ever. All my major food groups are in here: sweet potatoes, kale, more kale, and avo. Makes for great travel food! I have been packing these for my lunches on the go and they are a serious life saver and tasty treat. 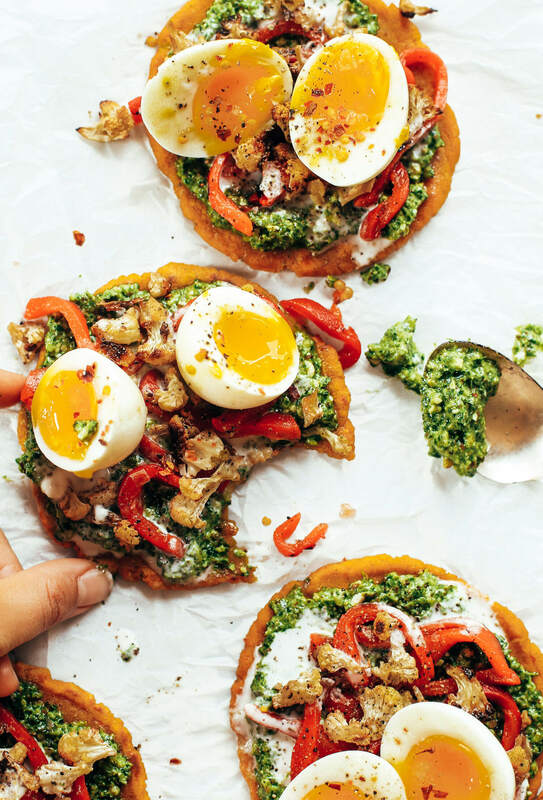 Sweet potato crust… I can’t decide if that’s the best part or if the kale pesto is. It’s basically like salad you eat with a spoon. I have been dipping my veggies in this glorious stuff, putting it on my eggs, eating with a spoon, and on pitas, duh. Any excuse to eat pitas, I’m there. I’m noticing some major trends in my life recently. The never ending golden latte saga. I was so happy to find a cute coffee stop with golden turmeric lattes on the menu when I was in Montana this week. It was like, hello! I know you! You make me happy. I’ll drink one of those because they taste like sunshine and happiness in my belly. If you have any excuse to drink a golden, DO IT. I mentioned the kale pesto. But the other major player right now is the massive sweet potato trend going on in my life right now. I’ve been making sweet potato gnocchi, blackout healthy paleo sweet potato chocolate cake, sweet potato smoothies, sweet potato avocado fudgy brownies. The list goes on, so I won’t bore you. But you get the idea: I’m pretty one track minded right now. So, soak it while you can, because next month I’ll probably want to be making zucchini or broccoli everything. In a food processor or bowl combine ingredients for pitas until smooth. Note: Add more or less cassava flour to get the dough to be pliable. If you don't have cooked sweet potato on hand, make it by peeling a large sweet potato, cutting into 2" chunks, and boiling in water until soft (drain water from sweet potatoes after boiling). Separate dough into 4-5 equal parts and press down with your fingers into flat 5" pitas on a baking tray lined with parchment paper. Bake on 350F for 10 minutes on each side until golden brown. Preheat oven to 425F. Add chopped cauliflower on a baking tray lined with parchment paper, drizzle with olive oil, salt and pepper to taste, and bake on 425F for 30 minutes. To make soft boiled eggs, bring a pot of water to a boil then add eggs and boil for 7 minutes. Remove eggs and chill in an ice bath before peeling. In a food processor blend ingredients for kale pesto until it reaches desired consistency. 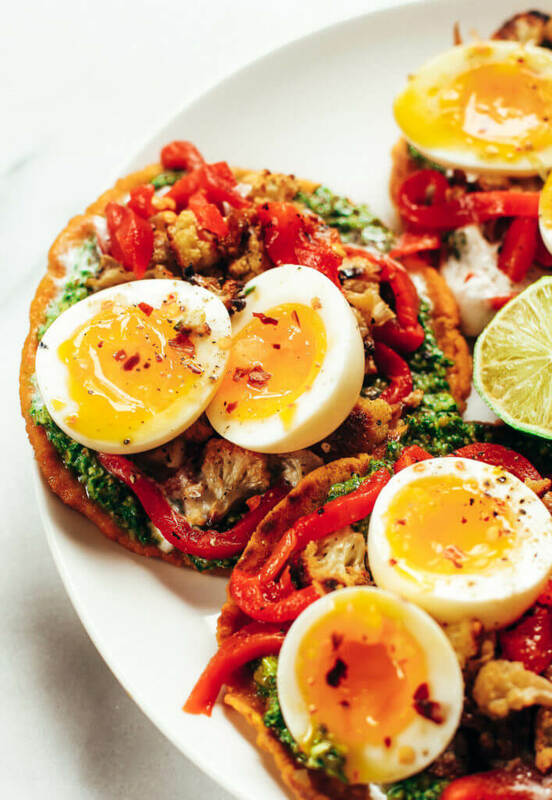 Assemble pitas by layering on pesto, roasted cauliflower, red peppers, and eggs. Top with fresh lime juice, chili flakes, and coconut milk to taste. 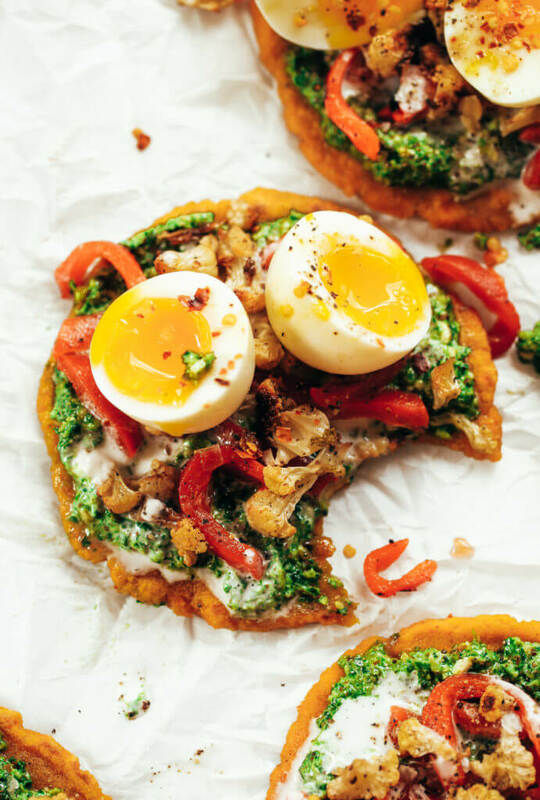 Can’t wait to make and try this. Thank you for sharing. Can’t find cassava flour in my town, tried two places today. Will have to order from amazon I guess! Made the kale pesto though, so good!!!! These look amazing! I’m allergic to eggs – do you think I could use something else in place of the egg? Do you think a flax-egg would work? Thanks in advance! I am totally in love! With my busy schedule travelling, I do not carry any cookbooks with me and the places I am staying at, are not always equipped in enough of appliances to make them according to the recipes, so I just cook from my heart most of the time. But your recipes girl! They simply rock! 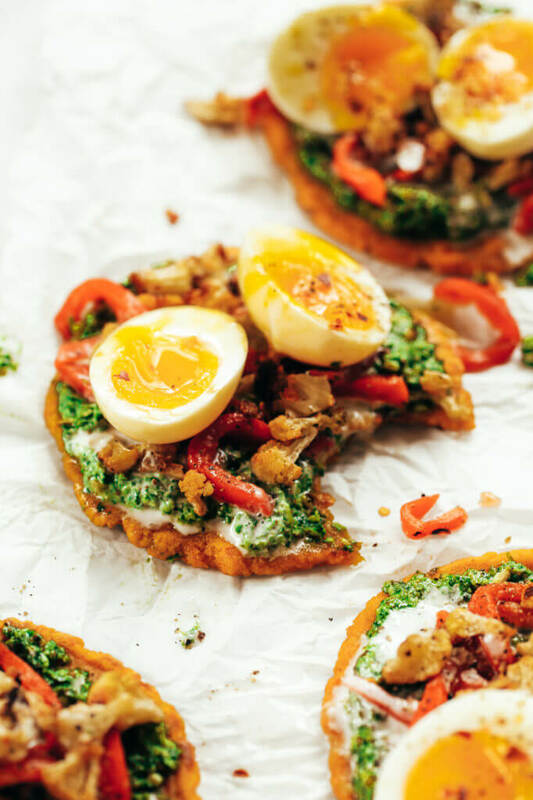 They work, they are delicious, nutritious and easy! I do carry my own tiny food processor and a blender and I feel, like this is all I need to create from your recipes. I thank you from the bottom of my heart! So does my husband… I have already shared the pizza and 5 minutes bread recipe with his tribe. Wow and you go girl! I bow your creativity, cooking skills and photo taking skills – they are the best combo I have ever seen. Thank you so much Marzi! Hi Kaylie, how would these sweet potato pitas store/save? Would you reccommend keeping them in the fridge? Thanks!